Did Our Gorgeous August Affect Real Estate Sales On Seattle’s Eastside? The end of summer brought the first decline for Seattle Eastside home sales this year. I wouldn’t get too alarmed, though, as sales dropped by only 2.5%. August always seems to be a slower month as people rush to get kids ready for school or cram those last summer weekends full of fun activities. 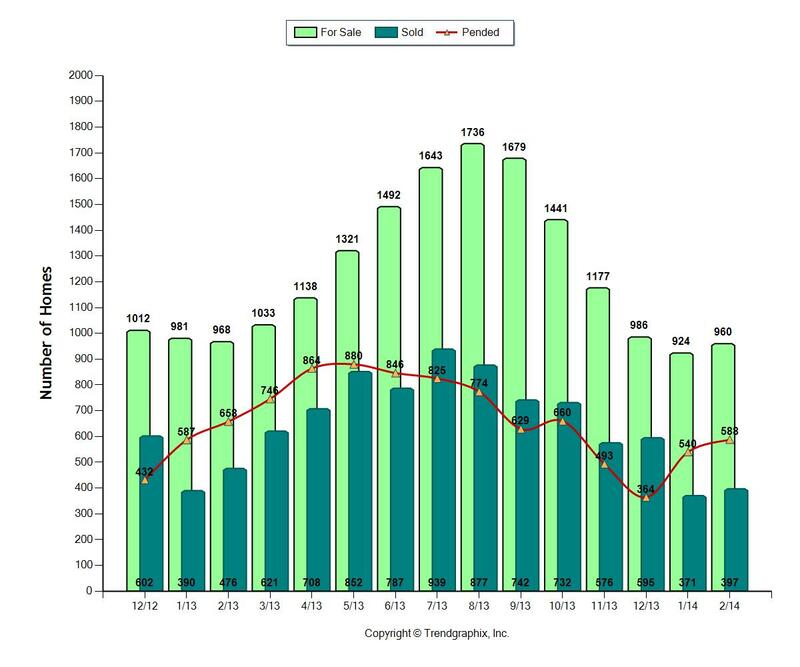 The number of pending sales this year, 768, is very similar to last August, when 776 homes sold. The market did not die after last August and it will not die after this August. The real estate market tends to get back to business as usual after Labor Day weekend. In August, 42% of the homes for sale sold on Seattle’s eastside, the lowest absorption rate for the year. The peak of sales activity, as it is every year, was back in the spring. In March, 67% of the homes for sale sold and in April 68% sold. Days on the market are still low as it is only taking 38 days on average to sell a Seattle eastside home. Median pricing was up to $600,000. Last August it was $515,000. If you’d like more information about the real estate market and the value of your home, don’t hesitate to contact us. The most number of homes for sale so far this year? No big surprise. We've seen the same roller coaster of real estate activity on Seattle's eastside every year. The market was still strong as almost 50% of Seattle eastside homes sold in July. The peak of sales activity, as it is every year, was back in the spring. In March, 67% of the homes for sale sold and in April 68% sold. In July, we have the most number of homes for sale so far this year, although August could top that number. Days on the market are still low as it is only taking 38 days on average to sell a Seattle eastside home. Median pricing was up to $625,000. Last July it was $575,000. Fall can be a great time to either buy or sell a home. There are buyers who will get serious as the cool weather approaches, wanting to get into a home before the end of the year. Don't discount the holidays either. Competition for buyers is so much less during that time. If you'd like more information about the real estate market and the value of your home, don't hesitate to contact us. Is Summer The Busiest Time for Real Estate on Seattle’s Eastside? No matter how many times people hear the market is the most active in the spring, many people think summer is the busiest time. Summer is still a great time to sell, but now that we're into an absolutely fabulous July, buyers often join friends and family for weekend outings. It can cause the activity to slow down a bit, but it does not go away by any means. In fact, we tell sellers to expect more activity during the week. With the days at their longest for the year, buyers often prefer to see homes after work and save weekends to enjoy the spectacular weather. Can a well priced, terrific home still sell for more than full price with multiple offers in our current market? Yes. We just sold one of our listings at 10% over the asking price. There were seven offers. Inventory is low, but inventory for great homes is even lower, so those go fast and for top dollar. Expect to see the number of homes for sale continue to increase. This will, hopefully, give buyers a few more choices and a little breathing room. The total number of homes for sale is still very low, while demand remains high, so sellers should still see a lot of action. This is what I said in last month's post regarding the Seattle Eastside real estate market. It's proving to be true, which is not a big surprise to Brooks and me. We've seen this very same cycle over the years. Every summer there's a spike in homes for sale. But the lack of inventory will still keep Seattle Eastside real estate activity strong. So how was June real estate on Seattle's eastside? Median pricing stood at $645,000. Homes sold well, with 57% of the available homes sold with an average market time of 32 days. Seattle Eastside Homes Are Still Moving Well! I was talking with a fellow Realtor earlier today who commented on a home that had taken a long time to sell and it was only on the market for 18 days! Since every home with a "for Sale" sign in front of it sold in a heartbeat during the first quarter of the year, 18 days now seem long. In reality, it's still an amazingly quick sale time. In May, Realtors started to see a slight change in the marketplace as not all homes sold immediately with multiple offers. Some homes sold in a week to a month. The Seattle Eastside real estate market is still going gangbusters, despite a jump in the number of homes for sale in May. The increase in inventory from April to May is the exact opposite of the decline in the number of homes for sale that we experienced in the marketplace last October into November. Inventory increased from April to May by 19% and dropped about that much last fall. Neither change in inventory was a huge surprise. Many sellers choose not to list their homes as the holidays approach. Conversely, spring into summer often experiences an increase in inventory. Mind you, the demand is strong for housing and inventory is still very low, it's just been creeping up since the first of the year. So how was May real estate on Seattle's eastside? Median pricing stood at $619,000. Homes sold well, with 69% of the available homes sold with an average market time of 33 days. It's a pretty crazy real estate market out there on Seattle's eastside. The fever pitch of the real estate market is running high right now. Buyers and their agents are having to be far more creative with their offers to be the buyer who wins the house. Pre-inspections are the norm, something that has been very common place in Seattle's market. Buyers are willing to bring more money to the table if needed to make a sale happen. Many listing agents are holding offer review, often for a week, to give good exposure to a home. Buyers then have an opportunity to look at the home more than one time, pre-inspect if they so choose, and plan their offer strategy. It's a competitive market, but it gives an opportunity for a buyer to make a more educated decision. Appraisers are having to be more creative to find comparable sales to demonstrate value. However, it's often hard to dispute the value of sales simply because there are so many mulitiple offers. it's not just one buyer who steps up to the plate to buy a house, it's usually a number of buyers. I've heard of all kinds of numbers of buyers bidding on one house, 3, 5, 7, 9, and on. So how was real estate in March on Seattle's eastside? Median pricing was just up over $600,000, only the second time in years, and I mean years. Homes sold briskly as 71% of the available homes sold last month with an average market time of 54 days. 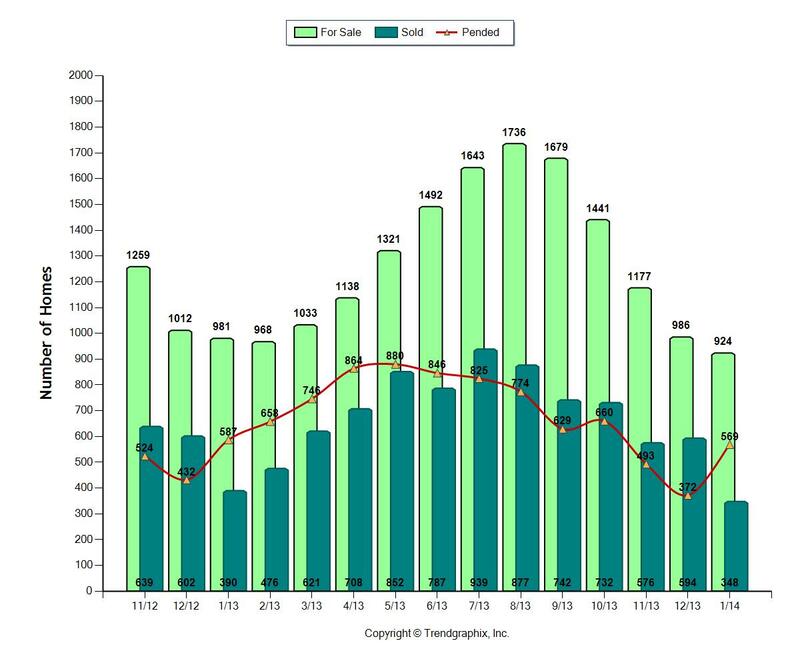 If no other homes had come up on the market, it would have only taken a month and a half to sell off all the inventory of homes. As I said, there is a fever pitch to the real estate market. If you'd like more information about the real estate market and the value of your home, con't hesitate to contact us. 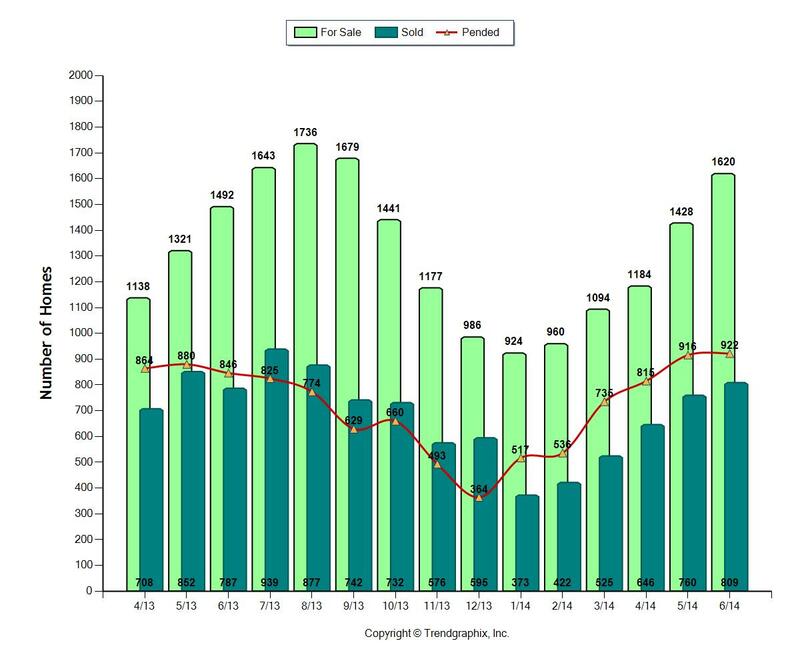 It's unusual that both January and February of 2013 and 2014 started out with a similar supply of homes for sale. Both years began with a very short supply. The lack of inventory experienced in 2013 continued into 2014. Even though the supply of homes for sale was the similar, the number of sales were less this year than last. 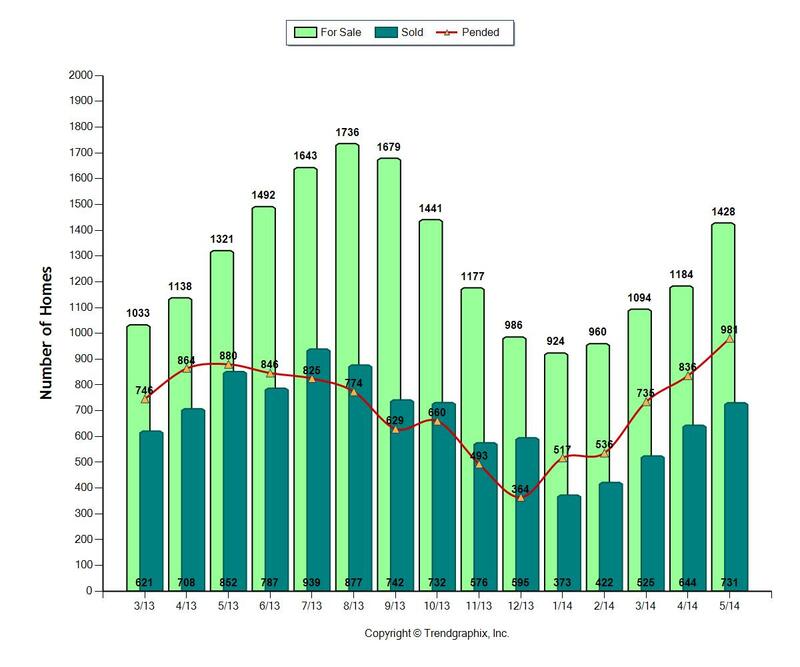 This February 558 homes sold, whereas in 2013,there were 658 sales. It's suprising, given the positive attitude of the real estate market and the low unemployment rate in the Seattle area (see #115) This year's fewer sales could be with the low inventory, prices have risen and buyers are becoming more selective with a home purchase that could cost more this year than last. Some agents think the Superbowl had an affect on lower sales in February. When people are busy with major events, and the Superbowl was major for Seattle, real estate can get put on the back burner. March sales figures will be more telling in that regard. If a house comes up for sale that's a great home, though, look out! Usually there's more than one buyer for a terrific home. The houses that sell really capture the hearts of the buyers, and often more than one buyer at a time. We just sold a home to a buyer who was competing with two other buyers for a house. Our buyer got the house, which they love, but paid more than full price by to win house over the other buyers. With competing offers, often the only way to get a house is to pay more than any of the other buyers and include your first born! The press reported that home prices dropped both in January or February this year. Yet, home prices have jumped since February, 2013. Median pricing this February was $676,000 over last year's median pricing of $567,000. If you have questions about the value of your home in this market, don't hesitate to contact us. We'd be happy to let you know how real estate is performing in your neighborhood. Ironically this January started out just like last January, when there were not enough homes for sale to meet the demand from buyers. Last year appreciation soared into the double digits for the first time in years because of this lack of inventory.. The difference between last year and this year? Because of the lack of inventory last year, prices jumped up. The median price for real estate sales on Seattle's eastside this past January was $600,000. In 2013? Median pricing was $513,000. Price per square foot for a home on the eastside went from $228 to $268. 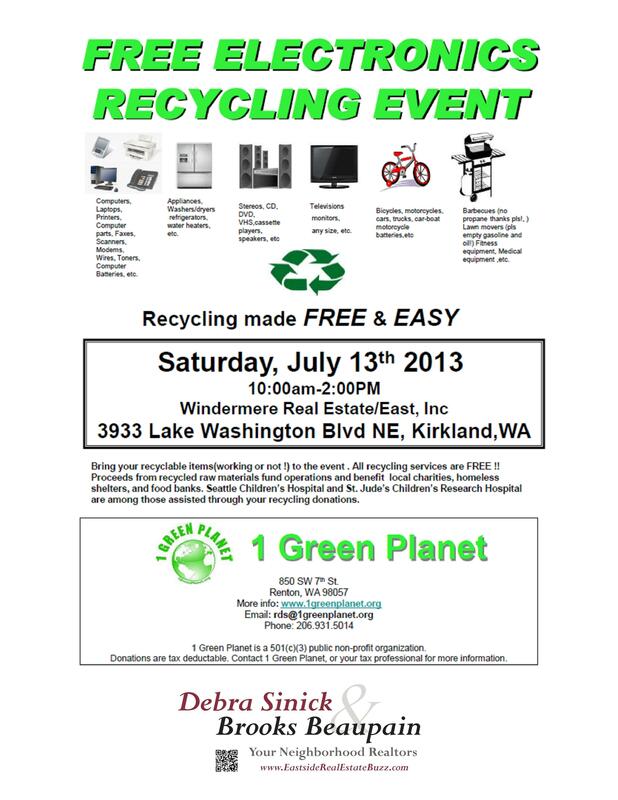 Eastside sellers, this is your time. Buyers are lining up to buy the homes that show well and are priced well. Buyers, it's not going to get less expensive in the future, so it's in your best interest to get out there and start looking now, rather than later. This may sound like hype, but it is the reality of the Seattle Eastside real estate market. It's very simply the law of supply and demand that's at work here. But while you are pondering real estate, enjoy Valentine's Day! Is the Seattle Eastside Real Estate Market Healthy in the First Quarter of 2014? The number of distressed sales, bank owned and short sales, has dropped in half from 2011. Only 13% of the real estate sales on Seattle's Eastside at the close of 2013 were distressed sales. More and more homeowners are reaping the benefits of the increase in sales prices and are no longer underwater. This is good news for the marketplace and bodes well for 2014. Prices should continue to increase as long as the general supply is low and the demand is strong. We expect to see even fewer distressed sales this year as the market is heating up with the low inventory. Did July’s Real Estate Prices Really Go Up By 7% on Seattle’s Eastside? The Seattle media had screaming headlines recently about the 7% increase in King County real estate prices this July when compared to last July. Were the newspaper headlines right? As I've mentioned before, yes and no. What did the media get correct when they said prices had gone up from July, 2011 to 2012? They were only comparing the sales from July, 2011 to July, 2012. The median price was based on the sales that happened only in those two months. This could mean more expensive homes sold in 2012 than in 2011 or it could mean prices were higher. It is hard to know based on this one month. 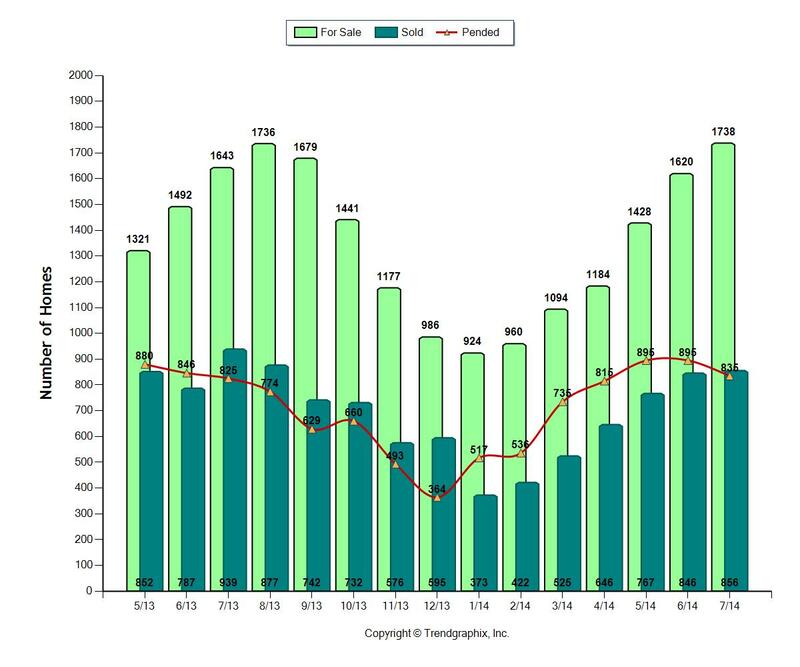 A snapshot of one month's real estate sales does not make a trend. It only shows how sales compared for those two months, so the Seattle Times was correct in stating the prices had gone up in from July, 2011 to 2012 by 7%. However, this is not the full picture. How can you more accurately tell if real estate prices are going up, down or staying the same? It's important to look at a pattern for a period of time, such as you can see in the chart above. 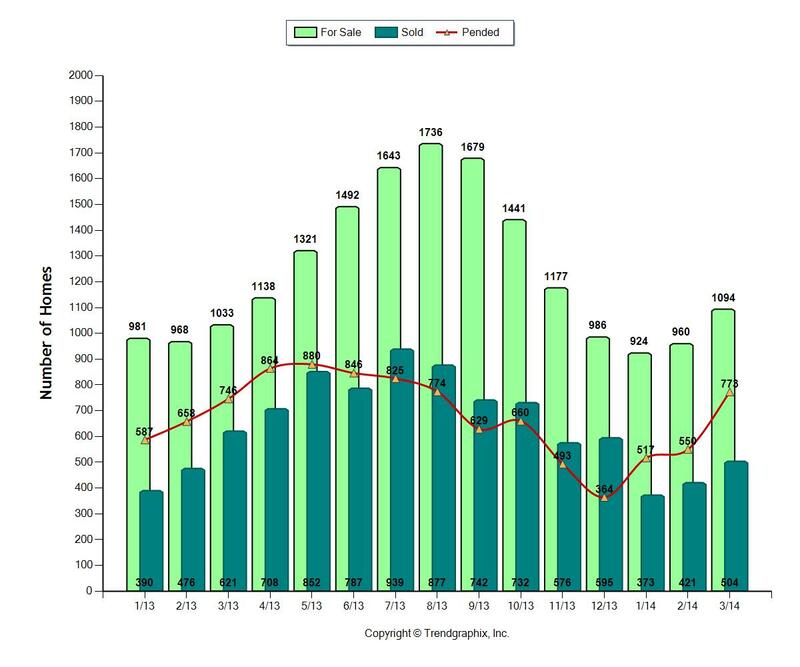 The chart is a compilation of all the home sales on the eastside, including such cities as Bellevue, Kirkland, Redmond, Woodinville, Sammamish, Issaquah and more. The NWMLS (Northwest Multiple Listing Areas) for these eastside cities are represented by area numbers 500-600 displayed at the top of the chart. 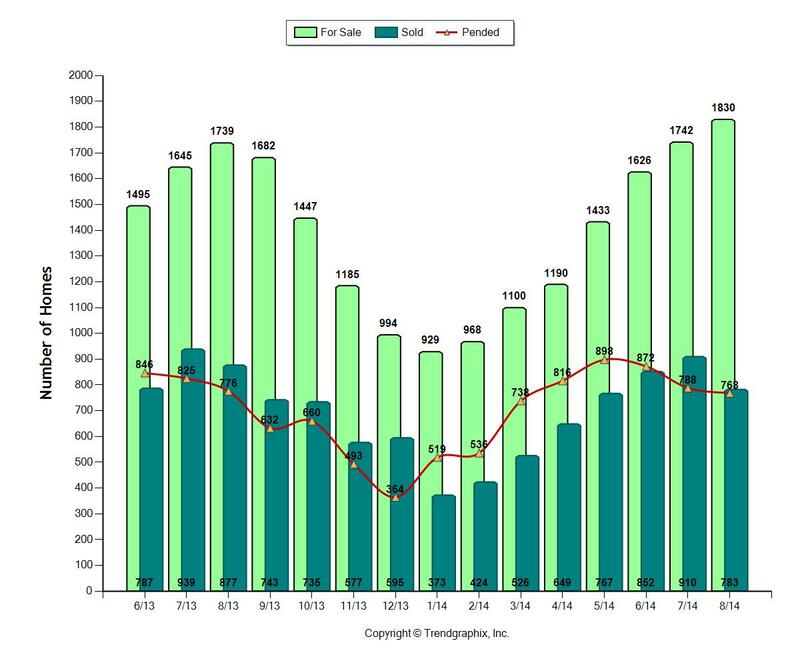 Windermere Real Estate compiled the data from each month and developed this chart to show median pricing for the past 5 years. If you look at the bottom of the chart, you'll see the years 2008-2012. Each blue bar above the years represents a month during each of the years. The red line going across the chart shows the median price point for each year. It was highest in 2008, when the median pricing for the year stood at $623,733 and had gone down consistently through the end of 2011, when the median pricing for the eastside stood at $502,784. This year the chart shows the median pricing is creeping up, but here on the eastside and in other parts of King County, it's not up by 7%, but by about 3% so far for the year. The median for this year is at $518,309. 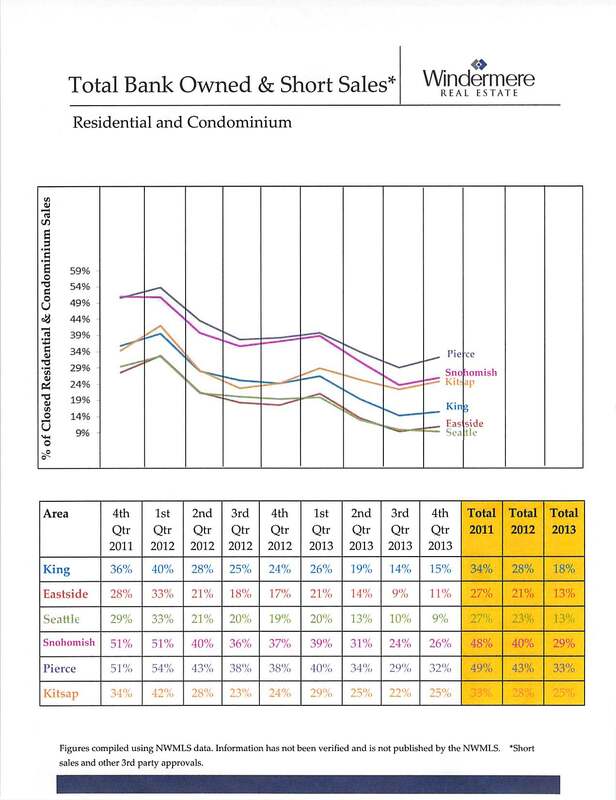 This is a much more accurate picture of real estate values on the eastside, not just a measure of one month's sales. Are you seeing similar trends in your area? If you have questions about the value of your home, please feel free to contact us and we can take a closer look at the data for your home.